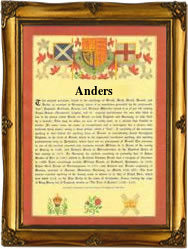 This interesting ancient surname, with spellings which include Andre, Andrea, Andree, Andrey, Andress, Andriss, Andri, Ander, and Anders, the latter being a patronymic, is derived from the personal name Andrew, itself from the Greek given name "Andreas", a derivative of "anderios" meaning "manly". The modern Andre often appears as Andre with an acute over the final e, an introduction from France, though one suspects that the accent is not always original. However, this form may be French, and introduced by some of the thousands of French Huguenots who fled to England in the mid to late 17th Century to escape religious persecution on the Continent, especially after the Revocation of the Edict of Nantes by King Louis X1V in 1685. The surname was first recorded in the begining of the 13th Century and examples include Geoffrey Andre in the 1279 Hundred rolls of Cambridge, John Andres in the 1326 rolls of the London Pleas, Robert Andreu of Cambridge in 1273, Henry Ander of Oxfordshire also in 1273. Later recordings include Thomas Andreu, vicar of Biston, Norfolk in 1442, whilst church registers include the christening of Anne, daughter of Pierre and Marianne Andre, French Huguenots, at Westminster, on February 13th 1754, and on January 28th coincidentally in the same year of 1754, Richard Anders was a witness at the christeneing of his daughter Mary, the the famous church of St Clement Danes, London. The coat of arms has the blazon of a silver field, two blue mullets in chief, and a black galley in base. The first recorded spelling of the family name is shown to be that of Josep Andree, which was dated 1229, in the "Calendar of the Close Rolls", during the reign of King Henry 111, known as "The Frenchman", 1216 - 1272. Surnames became necessary when governments introduced personal taxation. In England this was known as Poll Tax. Throughout the centuries, surnames in every country have continued to "develop" often leading to astonishing variants of the original spelling.